Russia and Argentina will consult on using national currencies in mutual trade settlements, Russian President Vladimir Putin said during a news conference with his Argentinian counterpart Cristina Fernandez de Kirchner. “We agreed to hold extensive consultations on the question of using national currencies in trade payments between states and between commercial partners,” the Russian President said. Russia has set up similar schemes with China, Iran, Egypt, and Turkey to cut out the US dollar, the so-called middleman used in most transactions. In October, Russia and China agreed a currency swap worth over $20 billion, in order to increase trade and business between the two. Earlier in April, Russia proposed setting up a similar system with Vietnam and Indonesia. The two heads of state also signed 20 agreements ranging from energy projects, economic development, agriculture, trade, military cooperation, as well as memorandums to boost environmental protection and fight drug trafficking. Among Latin American countries, Argentina is Russia’s fourth biggest trading partner, after Brazil, Mexico, and Ecuador. Trade between Argentina in Russia was $1.4 billion in 2014, compared with nearly double that in previous years, due to reduced oil supplies from Russia. More than 84 percent of the goods Russia imports from Argentina are agricultural, such as fruit and meat. 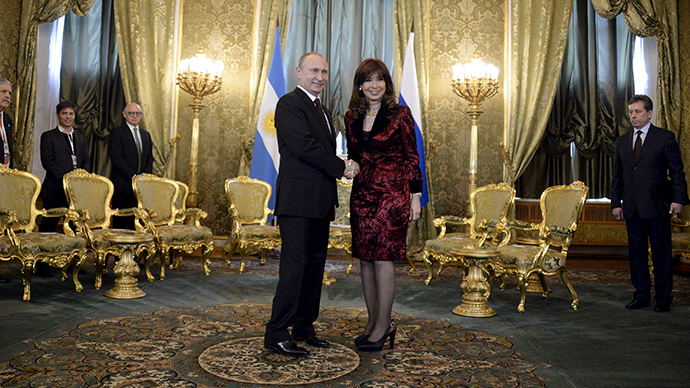 Cristina Kirchner has been on official visit to Moscow since Tuesday. The Argentine president met businessmen, politicians and opened a Moscow exhibition dedicated to the spiritual leader of Argentina Eva Peron. This year also marks 130 years of Russian-Argentine diplomatic relations.